On June 27th, 2013 I began anticipating Soylent, talking about Soylent, impatiently waiting for Soylent to become available. 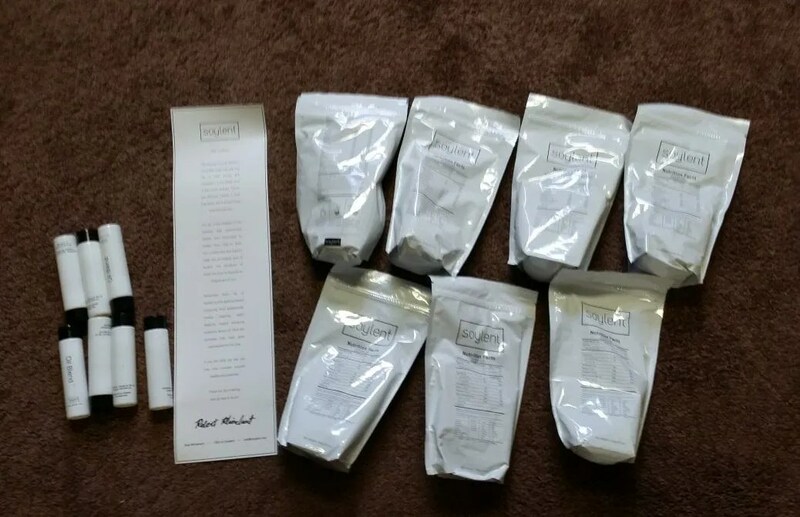 I signed up for a week’s supply of Soylent on June 10th and it arrived on July 22nd. 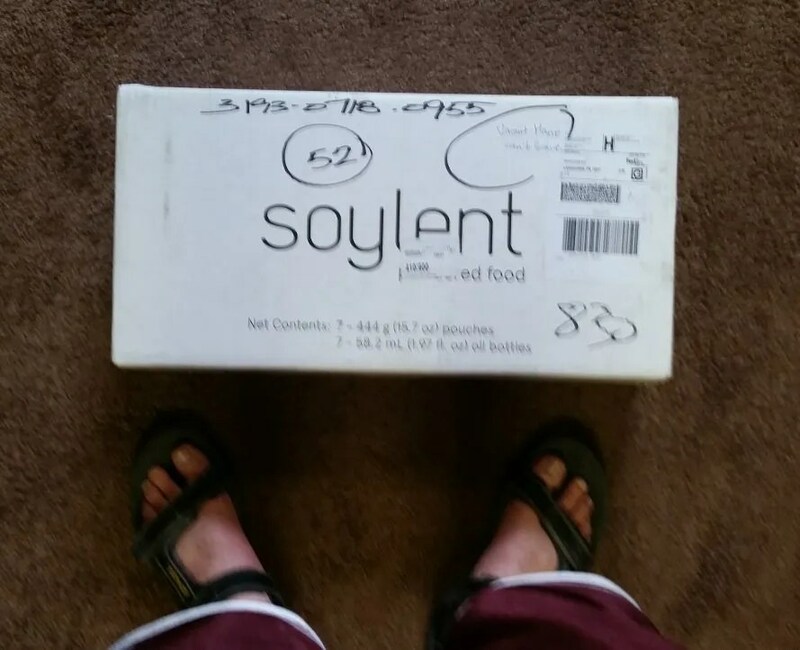 A picture of my box of soylent…and of course, my feet, b/c I’m talented with cameras like that. Inside was a long sheet with instructions…I’m not a fan of the big sheet…What am I supposed to do with this? Unless I hang it on my way there is no easy way to store it. The awkwardly long Soylent instructions. You can click on the above image to see how long the instructions really where, but it would have consumed too much space on the page for me to embed the image here. Next we had the bags of Soylent and the bottles of oil. You can see a picture below. What came in the first Soylent box I received – instructions, oils, and soylent. Stainless steel measuring cup from Soylent. But I hadn’t and I didn’t for quite some time. I attempted using some of my own implements to make Soylent but had mixed successes. If this was what Soylent tasted like, I wasn’t going to stick with it. After a few tries I decided I would just wait until my welcome package came. Ohh, and yes, I sent an email reporting the missing welcome package on the 23rd and of course received the usual automated reply the same day. It would be August 9th before I would receive a reply from Soylent and then to be informed that “I have forwarded your concern to our shipping department…” Then silence. Finally, on August 18th I received an email informing me that my starter kit was on its way. Okay, that is a pretty ridiculous wait…the organizational side of Soylent has been extremely underwhelming…I’m not sure all of what happened behind the scenes, but, honestly, I don’t care that much if Soylent is good and works and if they learn from their mistakes – which, it seems (I hope), they are doing. On a side note, the disorganization worked out to my advantage as I received a second shipment of Soylent by accident and when I asked what I should do with it they told me to keep it. I was pretty happy about that (though I feel bad for folks who ordered far before me and way more and still have not received their Soylent). But How About It, Is It Good? Now that you have heard about the nightmare of procuring my Soylent, lets talk about Soylent itself. It is a very fine mix and comes in bags that each contain three meals. I found trying to make Soylent in smaller portions to be a hassle – not only because of measurements and so on but because the powder is so fine that it puffs up into the air and lands everywhere while scooping. In any case, I moved to making a whole packet at a time and it was so much easier. 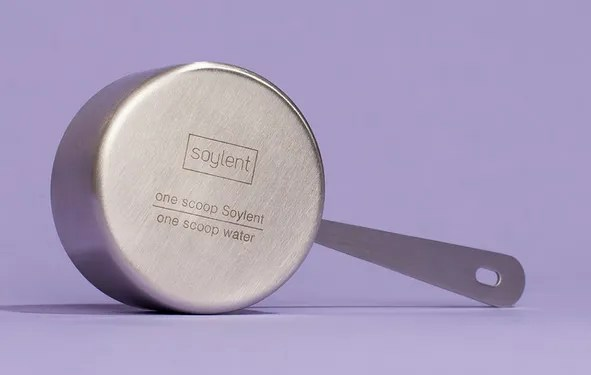 Okay, I know for those of you who cook, you are rolling your eyes – and yes, in the distant past I did sometimes cook – but the whole point of Soylent is to save time and improve nutrition. Making Soylent was now simple – pour in the powder, add a bottle of oil, and then fill the rest of the pitcher with water. Screw on the air-tight cap and shake for around sixty seconds. Place in the refrigerator, remove when ready to consume, shake for five to ten seconds, then pour yourself a glass and enjoy. Soylent tastes a bit like a milk shake. It has a pleasant flavor, though one I can’t place. Compared to any other powdered drink (Shakeology, RAW Meal), the “graininess” is almost non-existent. It tastes good, the texture is good, and its easy to make – sweet! Another surprising and positive note is that it uses water not milk or a milk substitute and yet tastes better than Shakeology with (in my case) almond milk! Seriously, if you didn’t see the batch mixed, you’d swear it had to have a dairy base. So, I like my Soylent and I intend on continuing to consume it. Right now I average two meals a day of Soylent and one meal elsewise. I allow myself to eat whatever I desire for that third meal – but my cravings for unhealthy foods seem to have lessened somewhat (not completely). Should you get Soylent? Sure. Just be prepared to wait a bit. 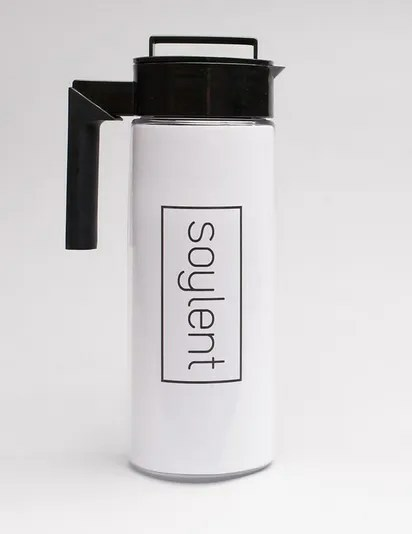 I think organizationally they are getting there, but with the delays initially as well as the huge demand, and then the ongoing demand for resupplies, it is going to be a while before Soylent is working smoothly. One of the great things about Soylent is that it lasts forever (hyperbole) in powder form. Something I didn’t realize until I received my Soylent is that once it has been mixed with water it needs to be consumed within two days. Apparently due to the nutrient richness of the drink, even while being refrigerated bacteria multiply quickly. I would like to know more about the health implications of this. I oftentimes eat food far past its expiration date – especially dairy alternatives (almond milk, soy milk) and don’t have any problem…so I’d probably ignore this warning except after posting on the forums I learned that the bacteria make the taste go bad quickly – so its not just filled with bacteria, it tastes nasty too. Still, I’ve been consuming Soylent over a two to may three day period and haven’t experienced issues thus far…and making it in this size batch saves me from measuring, etc. Each time you use a bag of Soylent you are supposed to add the oils as well – which provide some important aspects of Soylent’s nutrition. Being ADD, I have on occasion forgotten to put the bottles into the Soylent. This doesn’t bother me, but it is a dilemma – what am I supposed to do with these bottles of oil? There was a lot of discussion of increased flatulence when using Soylent which, it is hypothesized, is caused by the bacteria in our stomachs not knowing how to handle nutritional food and the replacement of some of these bacteria with better bacteria that do consume this food. I had no intention of mentioning flatulence, b/c I really don’t like talking about it. I was never a fart guy joker…but I must mention it, b/c it radically increases flatulence and it smells horrific. This goes away after a few days – but my recommendation – start Soylent when you aren’t spending a lot of time with people…and please, give your spouse a break and sleep on the couch…or at least let them sleep on the couch. My plan at this juncture is to continue Soylent 2x daily long-term. We’ll see if I grow sick of the taste…which is very possible. I haven’t noticed any huge changes in my health, but that may come with time. I also am hoping to get my blood drawn and analyzed every quarter by WellnessFX so I can monitor my health, especially vitamin levels, but that hasn’t happened yet. Soylent is great – I’m exceptionally pleased with the product itself. The company has some work to do – and seems to be doing it. I haven’t noticed any amazing positive health effects, but I’m hoping over time it works positively. I’ll provide future updates as I’ve been on it longer and can analyze how I respond to the taste with continued consumption and whether I see any health changes positive or negative. I’m not 100% on this, but I’m pretty sure that what Soylent has isn’t a problem. It is a Soy protein isolate as opposed to Soy. Previous story Infographic: Medications That Deplete Nutrients and How to Supplement Appropriately.